Many people have a hard time picking the difference between a graphic designer and a brand designer. Their job description might be in the same lane but believe it or not, there are rather different. But we do not blame you as the two are different but do work hand in glove. And this article will aid you to separate the two. To note is the fact that branding came first before graphic designing. But that doesn’t mean that graphic designing becomes useless. In fact, there are both important in their own way, as they both have different impacts on a business. Now without wasting any more of your time with our mumbling let’s get right into it! 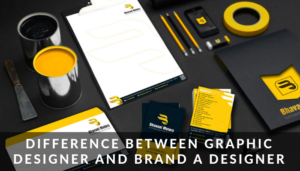 By definition branding, “It is the process involved in creating a unique name and image for a product in the customers’ mind.’’ In other words, a brand designer aims at establishing a distinctly different presence of the company in the industry. We are talking about what sets your company or the product you are offering apart from the rest. To be quite frank with you, this is rather one of the most crucial roles. What we are saying is that when you are a brand designer it is your job to make sure that the ideas, goals, and intentions of the product/ company are clearly understood by the targeted audience. The reason why we pointed out that this is the most crucial stage is that of the following reasons. When a brand designer encodes a message, it is up to the targeted audience to decode it. And it is up to the brand designer to make sure that they decode the message in line with the intended message. By definition graphic designing, “Is also known as communication design, is the art and practice of planning and projecting ideas and experiences with visual textual context.” After a brand designer is done, now the graphic designer brings these ideas to life by beautifying them. Graphic designers translate the work of the brand designer. You know what they say, “seeing is believing.” At times when you try to explain something in a rather serious manner, people fail to get it. But try to explain it in something that everyone can relate to and people will get the picture. So keep on reading and we give you a metaphoric perspective of the difference between the two and see if you can get the picture. Take a brand designer to be a person. All the attributes that come with the person that include, personality, past and current experiences, attitude just to name a few. All this you develop on your own. Your personality is what makes people attracted to you, this is what will entice people. Then we have the graphic designer being the personal shopper, the tailor, your stylist. What they do is make sure is that your clothes fit your personality. And most importantly they ensure that you are always looking sleek and on point. People love what they see in and out. That is why these two the brand and graphic designer work together. To make sure that the clothes fit the personality and that the personality is to fall in love for. The two have to be in sync! We can you help you with getting your brand design in Zimbabwe. Why not give us a call on +263 776 260 360 or email us to discuss your brand design project whether you are in Harare or anywhere in Zimbabwe. Get a free no obligation estimate or contact us to discuss your exact requirements. We appreciate that your business is unique in its own right. Therefore, we will develop a brand design plan and approach for you. Kindly fill the form below and we will reply you urgently with a custom pricing quotation. We are open from Monday to Friday 8 am to 5 pm.